1. To make the green curry paste, toast the ground coriander and cumin in a dry pan over medium heat for 30 seconds, stirring occasionally, to release the aroma, and then add the ground black pepper. 2. Put the spices and all the remaining ingredients in a food processor or blender and blend together until smooth. Alternatively, use a pestle and mortar, which is more authentic but rather time-consuming. 3. Preheat the oven to 220°C (425°F) Gas 7. Put the squash and aubergine on the prepared baking sheets, and season with salt. Roast for about 15–20 minutes, or until soft and the edges are browned. 4. 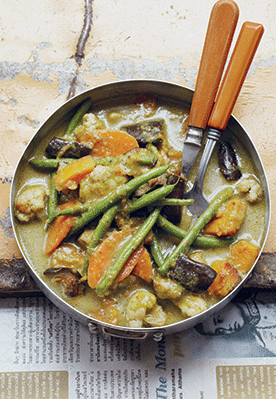 To make the curry, add 1 generous tablespoon of green curry paste per person to a large pan and fry gently for 5 minutes. Add the prepared vegetables (including the roast squash and aubergine), the coconut milk, salt, soy sauce and vegetable stock. Stir and bring to the boil. Simmer for 7-8 minutes. Check the seasoning and add more salt if needed. Serve with steamed jasmine rice. Recipe courtesy of Vegan Street Food by Jackie Kearney (Ryland Peters & Small).